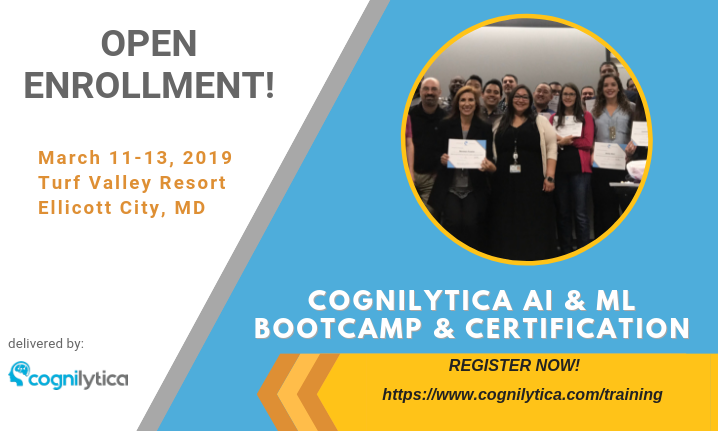 Cognilytica’s AI & ML Project Management Boot Camp and Certification is recognized around the world as one of the best AI & ML bootcamps for those trying to implement real-world AI & ML projects. The intensive, three day “fire hose” of information prepares you to succeed with your AI & ML efforts, whether you’re just beginning them or are well down the road with implementation. Cognilytica’s training is the only public course that Cognilytica offers, reflecting the best thinking and research that Cognilytica produces. This is the only open enrollment course being offered for Q1 and enrollment is capped at 25. 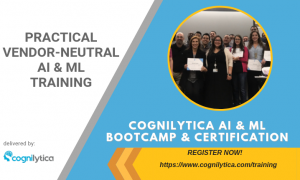 Cognilytica’s AI & ML Project Management Certification has no prerequisites, and is designed for people managing AI & ML projects but appropriate for people with different roles and levels of expertise. This course is valuable for anyone who wants in-depth knowledge about how to succeed with AI & ML related projects. What makes the Cognilytica Bootcamp so special? We have secured a discounted hotel rate of $129.00/night plus tax for folks attending our training. Please call Turf Valley resort (410-465-1500) to book your room and reference Cognilytica – 2876SW when booking. This discounted rate is available for March 10 – 12, 2019. Attendees are responsible for their own travel and transportation.